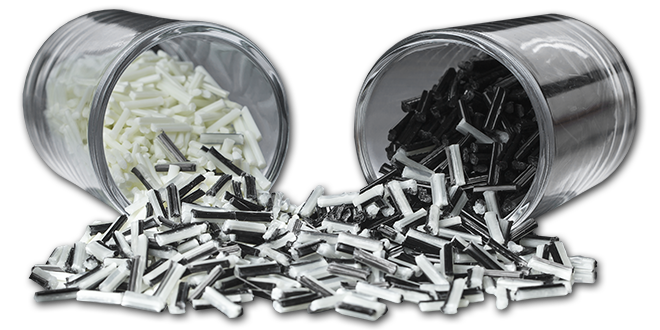 PlastiComp manufactures our Complēt long fiber composite pellets using a pultrusion process. We start with tows of continuous fiber which are pulled from creels through a proprietary impregnation die where the fiber becomes melt impregnated with thermoplastic polymer. A compounding extruder connected to the impregnation die functions as a melt pump feeding molten thermoplastic polymer into the process. Instead of simply coating fiber tows with polymer – inside PlastiComp’s impregnation die individual filaments in the fiber tows are spread apart so each is encapsulated with thermoplastic polymer. Our process achieves higher “wet-out” of individual fiber filaments which is necessary to create a strong bond between the fiber and thermoplastic polymer. This fiber to polymer bond is key to obtaining optimum performance and having a true composite material. Depending on the type of fiber being pultruded, tows have from 2,000 to 50,000 individual filaments of fiber with diameters ranging from 7 to 14 microns. The melt impregnated fiber exits the die as continuous composite strands which are cooled using water and/or air until solidified. Strands then pass through a puller unit which keeps the manufacturing process continuously operating and provides its pultrusion (pulled extrusion) name. Finally, a pelletizer cuts the composite strands to a specified length. 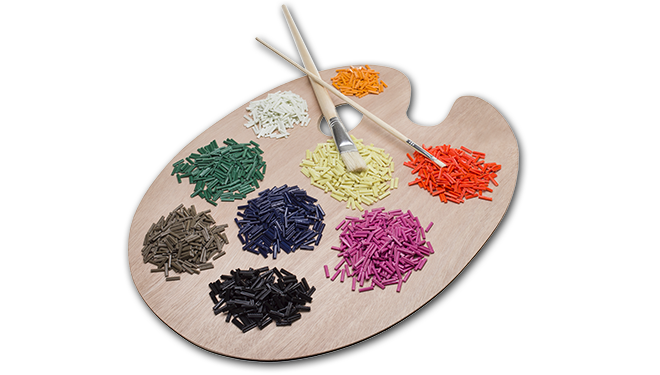 Typically for injection molding processing 12 mm (0.5 inch) long pellets are the standard length to facilitate material handling and feeding into processing equipment. Pellet length can be varied from 6 mm (0.25 inch) to 48 mm (2.0 inches) depending on thermoplastic composite forming process requirements. As the fiber in our long fiber composites is continuous throughout the length of each cut pellet, long fiber materials have a higher fiber aspect ratio than short fiber filled plastics. Higher fiber aspect ratio provides the thermoplastic polymer with more ability to transfer energy to the stronger reinforcing fibers when the plastic comes under stress and also to dissipate that energy over a wider area.